Dark narrow streaks called recurring slope lineae (RSL) emanate from the walls of Mars’ Garni crater in this image by NASA’s Mars Reconnaissance Orbiter. These RSL are up to a few hundred meters in length. They are thought to be formed by the flow of salty liquid water. Liquid water flows on Mars today, boosting the odds that life could exist on the Red Planet, a new study suggests. The enigmatic dark streaks on Mars — called recurring slope lineae (RSL) — that appear seasonally on steep, relatively warm Martian slopes are caused by salty liquid water, researchers said. Ojha was part of the team that first discovered RSL in 2011, by studying images captured by the High Resolution Imaging Science Experiment (HiRISE) camera aboard NASA's Mars Reconnaissance Orbiter (MRO). These dark, narrow, 100 meter-long streaks (called recurring slope lineae) are flowing downhill on Mars, and are inferred to have been formed by contemporary flowing water. 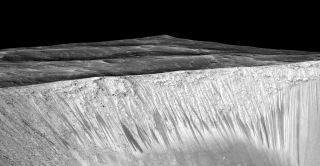 Recently, planetary scientists detected hydrated salts on these slopes at Hale crater, corroborating their original hypothesis that the streaks are indeed formed by liquid water. The blue color seen upslope of the dark streaks are thought not to be related to their formation, but instead are from the presence of the mineral pyroxene. RSL occur in many different locations on Mars, from equatorial regions up to the planet's middle latitudes. These streaks are just 1.6 feet to 16 feet (0.5 to 5 meters) wide, but they can extend for hundreds of meters downslope. RSL appear during warm weather but fade away when temperatures drop, leading many researchers to speculate that liquid water is involved in their formation. The new study, which was published online today (Sept. 28) in the journal Nature Geoscience, strongly supports that hypothesis, team members said. Ojha and his colleagues scrutinized data gathered about four different RSL locations by another MRO instrument, the Compact Reconnaissance Imaging Spectrometer for Mars (CRISM). "Using this instrument, we can deduce the mineralogical makeup of surface materials on Mars," Ojha said. "What we found was that at times and places when we see biggest RSL on the surface of Mars, we also found spectral evidence for hydrated salts on the slopes where RSL form." "Due to that, I do not think we will ever find the RSL still in their liquid form at 3:00 p.m., so I think this hydrated signature of the salts is definitely a 'smoking gun,'" he said. A previous study of RSL in Mars' huge Valles Marineris canyon system suggests that the features aren't exactly burbling streams, said study co-author Alfred McEwen of the University of Arizona. "What we're dealing with is wet soil, thin layers of wet soil, not standing water," McEwen said today during a NASA press conference about the new discovery. The RSL-associated salts appear to be perchlorates, a class of chlorine-containing substances that are widespread on Mars. These salts lower the freezing point of water from 32 degrees Fahrenheit (0 degrees Celsius) to minus 94 F (minus 70 C), Ojha said. "This property vastly increases the stability of brine [salty water] on Mars," he said. Perchlorates can absorb atmospheric water, Ojha said. But it's unclear if Mars' air is the source of the water in the brine flows. Other possibilities include melting of surface or near-surface ice or discharges of local aquifers. "It is conceivable that RSL are forming in different parts of Mars through different formation mechanisms," the study team writes in the new paper. Observations by NASA's Curiosity rover and other spacecraft have shown that, billions of years ago, the Red Planet was a relatively warm and wet world that could have supported microbial life, at least in some regions. Mars is extremely cold and dry today, which is why the discovery of RSL sites has generated so much excitement over the past four years: The features point to the possibility that simple life-forms could exist on the planet's surface now. But the new results don't imply that life thrives on Mars today, or even that this is a likely proposition, Ojha stressed. Perchlorate brines have a very low "water activity," he said, meaning that the water within them is not easily available for potential use by organisms. "If RSL are perchlorate-saturated brines, then life as we know [it] on Earth could not survive in such low water activity," Ojha said. The RSL discovery also has implications for the future human exploration of Mars, researchers said. NASA plans to put boots on the Red Planet by the end of the 2030s, and the presence of liquid water — even very salty water — on the surface could aid that ambitious effort. Indigenous water "may decrease the cost and increase the resilience of human activity on the Red Planet," study co-author Mary Beth Wilhelm, of NASA's Ames Research Center in Moffett Field, California, said during today's press conference. "Looking forward, it is imperative for us to further understand the source of the water for these features, as well as the amount." This story was updated at 1 p.m. EDT.